The Princess Club 4-H Girls....OH SO CUTE!!! Yes, we have our very own "Princess Club" at Riverview, and it is......OH SO CUTE!!! One has to see it to believe it. The room is filled with glitter and glam, perfume, makeup, shimmer, shine, bling, high heels, sparkly purses and all the trinquets and extras any little girl can dream of. Last week, the princess club worked on designing their own hair-dos. They, of course, walked the run-way, and showed of their beautiful new hair-dos that they created. It was quite the fashion show. We took their picture, and they did what all princesses do....they courtseyed. The 5th graders recently held their annual wax museum. Students at Riverview were very lucky to meet many famous people all in the same place, and all at the same time. Some of the wax museum figures included: Helen Keller, Amelia Earhart, Babe Ruth, Michael Jordan, and Elvis the King- himself. The 5th graders did a great job and the 5th grade teachers did a great job putting the show together. Way to go, 5th grade team!!! Ballet West Comes to Riverview! Students at Riverview posing with Ballet West Dancers! Ballet West came to Riverview Elementary. They taught the students different dance techniques, then asked the students to try them, and TRY them they did! The movements were a lot more difficult than the students thought! Ballet West performed some of their dances from Swan Lake, Sleeping Beauty and Puss in Boots.The dancers came out in costume, and the students did not make a sound- as the dancers mesmerized the students, with their ability to spin on their toes, maintain perfect balance and leap high into the air. Afterwards, students were able to ask questions about what the life of a ballerina is like. The dancers told the students that it takes a lot of hard work and dedication! They told the students to work hard and stay away from bad influences. 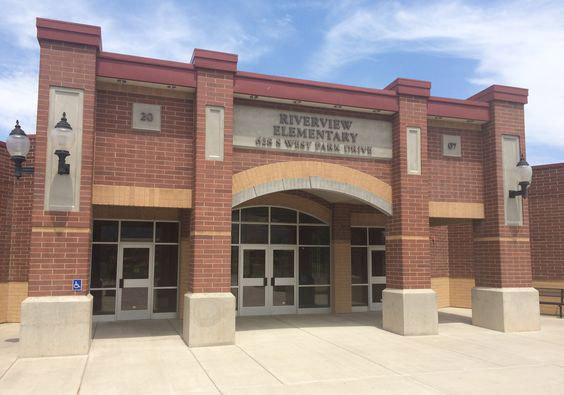 Kevin Eubank Visits Riverview Elementary School! Kevin Eubank at Riverview! AWESOME!!! CAN YOU FIND KEVIN EUBANK? He's at the top, in the middle. Kevin Eubank, meteorologist, from channel 5 news, visited the 4th graders at Riverview Elementary School! He talked about the crazy weather that Utah gets and how much he LOVES it. He talked about the rain, wind, flooding, avalanches, desert sand storms, freezing rain and tornadoes. He showed the students many pictures where one could see the dramatic effects weather conditions has had on our state. One picture was of an old record album that had been rapidly whisked into the air, by a tornado, and then later sliced through the middle of a telephone pole. Believe it or not, the record album was still in perfect condition. Mr. Eubank told the 4th graders to follow their dreams. He told them to never give up and choose a carreer that they will love to do.